We’re guessing that after yesterday’s FOMC meeting Fed Chairman Jerome Powell is back on President Trump’s Christmas card list. The FOMC left interest rates unchanged as expected. In every other respect the messaging from the meeting was markedly dovish. Both the statement and Powell’s commentary suggest the FOMC now has no intention of moving interest rates in either direction for an extended period – “Federal Funds rate is now in the broad range of neutral”. The press release itself contained a number of notably dovish observations: “growth of economic activity has slowed from its solid rate in the fourth quarter”…”slower growth of household spending and business fixed investment in the first quarter”…”overall inflation has declined”…”the Committee will be patient”. These were further reinforced in the press conference where Powell drew particular attention to the slowdown in the European and Chinese economies. Within the Q&A session Powell’s response to questions on the inflation outlook were interesting. Powell emphasised the need to avoid the Japanese and European disinflation trap and described low inflation expectations as meaning the Fed was paddling upstream to keep inflation up to their 2% inflation target. This meeting completes perhaps the fastest FOMC volte-face on record, moving from extreme hawkishness in early October 2018 to extreme dovishness now. All in all both President trump and his favourite measure of presidential success, the stock market, should be quite happy with the new fed tone. FOMC press release with our highlights. Technology is making the world a better place to live. We are living longer healthier lives due to technological progress improving our health, nutrition and safety. A case in point is the lifesaving technology of Intuitive Surgical, one of our favourite investments, whose robotic surgery technology recently saved the life of one of our clients. It’s worth taking a few moments to see just how advanced their technology is – video. It is the constant process of innovation across a wide range of industries that leads us to be so optimistic about the future from both the perspective of investment returns and, more importantly, quality of life. In fact, we are so optimistic about technological progress that another of our clients tells us he uses Equitile for ‘outsourced optimism’. He invests with us to gain the benefit of the progress, which allows him to continue worrying about the dire state of the world! To be fair, we must acknowledge all this technological progress has come at a price. Our improving quality of life is putting an increasing strain on the eco-system of the planet. If we are not careful the resultant ecological damage caused by our technology will more than undo its benefits. This is partially why we call this blog Rational Exuberance; we are exuberant about the future but, but we must keep the exuberance rational. Global warming is clearly the biggest environmental concern today. But even here there are good reasons for optimism. The cost of electricity generated by solar power is now approaching that of fossil fuels, and by some measures it is even cheaper. The cost of solar power is expected to continue falling and bring with it a real possibility that within a few years it will become technically possible and economically viable to generate all our power from renewable resources. Cheap solar energy is not the only practical barrier to a renewable energy economy. Solar panels may be able to generate cheap electricity, but they only do so slowly and of course only when they get sufficient sunlight. For this reason, improvements in energy storage technology will also be required to allow a full movement to renewable energy. At the moment we are reliant on battery technology for the storage of electricity and those batteries are both expensive and polluting to produce. For this reason, some see hydrogen technology as a preferable energy storage mechanism. Solar energy can be used to split the water molecule into its constituent parts – oxygen and hydrogen – and the oxygen and hydrogen can then be recombined or burned, to give up the stored energy either as heat or directly as electricity. The beauty of this hydrogen-oxygen based energy system is that it is based entirely on abundant non-polluting renewable resources, water and sunlight. What’s more it is also based on real well-proven science, not some charlatan pseudo-scientific cold-fusion technology, reliant on breaking the laws of physics. The technology to turn the dream of an endlessly renewable, non-polluting, hydrogen-based energy system into reality is still some way off. One of the most important missing pieces is finding an efficient, renewable and scalable, way to split the water molecule using solar electricity. Interestingly, in a recently published paper scientists working at Stanford university claim to have made an important step toward this goal. Their breakthrough is the development of a novel corrosion-resistant electrode allowing the generation of hydrogen directly from seawater. Researchers create hydrogen from seawater. It is too early to tell whether this particular piece of research proves to be the vital breakthrough needed to kickstart a hydrogen fuel economy. Nevertheless, it is encouraging to see such exciting progress being made in this field. As investors we must always remember the economy is ultimately driven forward by innovation and, thankfully, there is still plenty of innovation around. We will be watching this area of technology closely both for potential investment opportunities and for potential threats to our existing investments. See our Chief Investment Officer, George Cooper, speaking at Citywire's Fixed Income Retreat 2019 on Trump versus Powell and the outlook for monetary policy. The highlight of my week was lunch with one of our investors who happens to be a medical doctor, a general practitioner to be precise. He’s one of those people in life that’s always willing to question conventional thinking and so our wide-ranging discussion on politics, economics and medicine threw up some fascinating analogies. As I tucked into my lamb chop, he calmly asked why I was carefully dissecting the fat and shifting it to the edge of the plate. In all honesty, I wasn’t sure why but joked that I was staving off middle aged spread. It set him off on a tirade about some of, what he thought, were the crazy ideas that had infused the medical world over the last thirty years - especially when it comes to diet. He recounted a story of another lunch he had at the start of what we now call the obesity epidemic. He noticed a colleague carefully separating the yolk away from his egg and, like me, leaving it to the side of his plate – it was the time when cholesterol as a cause of heart disease was going mainstream and so his colleague, clearly keen to avoid the cholesterol in the yolk, was determined to diligently follow the crowd. The growing obsession with cholesterol and “fat avoidance”, our client argued, has left us feeling hungry and so much more prone to binging on starch in the form of wheat flour (he didn’t think there had really been a meaningful increase in sugar consumption over the last few years). He then went on to challenge, to put in mildly, accepted wisdom on the role cholesterol plays in heart disease. The cholesterol obsession, he told me, really took off in the 1950s when an American scientist, John Gofman, claimed to establish a “clear link” between cholesterol and atherosclerosis. He in turn inspired a prominent nutritional scientist at the time, Ancel Keys, to conduct the highly influential Seven Countries Study which examined lifestyle, diet and cardiovascular disease amongst different populations. One consequence of their conclusions is a $20billion industry in statins, a prophylactic drug now administered as standard here and elsewhere for anyone in their fifties with elevated levels of Low-Density Lipoprotein – so-called bad cholesterol. The evidence from the 1950’s study is now being seriously challenged and is widely considered as flawed by today’s standards. In 2016 an international team of scientists reviewed 19 studies involving 68,000 people and found no link between high levels of LDL and heart disease in the over 60’s. In fact they found that 92 percent of over 60’s with high cholesterol lived as long as or longer than those with low cholesterol. The study went even further and argued that there was some evidence that high cholesterol levels may in fact protect against some diseases, even cancer, by binding to toxic microorganisms. Our doctor client had his own theory. He pointed out that, historically, extended families in Mediterranean countries, where diet is often cited as low cholesterol, tended to stay together more than in the UK and the US, and so older generations had more young people around them. Numerous studies have cited loneliness as a key factor in heart disease in the aged. The link between cholesterol, heart disease and the effectiveness of statins remains controversial (and it’s certainly not for me to offer a conclusion) but our client’s story makes an important point. John Maynard Keynes is often quoted as saying “When the facts change, I change my mind, what do you do Sir?”. As is often the case, however, it’s not totally clear that Keynes actually used those precise words. A related but more reliable and useful quote comes from the American economist Paul Samuelson, “When my information changes, I alter my conclusion”. “Information” includes more than “facts”, it also includes the analysis and interpretation of the facts, so even when the facts don’t change it’s perfectly reasonable, on further analysis, to change one’s mind. The lesson? Keep analysing, keep questioning your interpretation and, most importantly, be willing to accept when you’re wrong. Next time I have a lamb chop, I’ll make sure to eat the fat as well. “As the pension scheme is a key financial stakeholder, we expect to see it treated equitably with other stakeholders. In last year’s annual funding statement we highlighted our concerns about inequitable treatment of schemes relative to that of shareholders. We remain concerned about the disparity between dividend growth and stable DRCs [Deficit Repair Contributions]. Recent corporate failures have highlighted the risk of long recovery plans while payments to shareholders are excessive relative to DRCs. We are also concerned about other forms of covenant leakage which may be occurring in preference of higher DRCs and shorter recovery plans for schemes. Where dividends and other shareholder distributions exceed DRCs, we expect a strong funding target and recovery plans to be relatively short. If the employer is tending to weak or weak [sic], we expect DRCs to be larger than shareholder distributions unless the recovery plan is short and the funding target is strong. Basically, the Pension Regulator is saying it is not prepared to tolerate companies paying out cash to shareholders when those payments leave the company unable to service its debt obligations. Doubtless this has been prompted by the BHS pension debacle. The regulator is undoubtably doing the right thing here. Nevertheless, it does highlight an ongoing risk for equity investors and for how businesses deploy their capital to grow their businesses. Companies with large pension deficits are being obliged to divert their capital into pensions from where it is then invested in low-yielding government bonds. At the aggregate level, the need to plug the hole in these pension deficits together with the fashion for pension funds to invest in low-yielding bonds risks undermining investment spending and therefore future economic growth. As we have said before, high dividend yields are often a sign of weak underlying companies (See – Depressed lobsters and the dividend yield trap). In light of this latest warning from the pension regulator UK focussed dividend investors should tread especially carefully. Warren Buffett, in his ever-humble way, mused this week that he had overpaid when he teamed up with private equity firm, 3G Capital, to fund the Heinz acquisition of Kraft in 2015. The 27% fall in Kraft Heinz’ share price last Friday was a big hit for Berkshire Hathaway who, on the face of it, had found a new strategy for deploying capital - a pressing problem given its significant and growing cash pile. In many ways the collapse is surprising. A global player with a portfolio of leading brands should, in theory at least, offer a quiet life for long-term holders like Buffett. By selling products we consume every day into a growing population, companies with negative earnings surprises this large shouldn’t really feature. The world is changing in all respects however and eating habits are no exception. Processed packaged food, a core segment for Kraft Heinz, no longer has the same tailwind it did. A cursory look at the global food mix brings this structural change into sharp relief. Kraft Heinz has been using old brands to roll out new products such as Mayochup, but a structural shift in the food industry indicates they might be focusing on the wrong sauce. 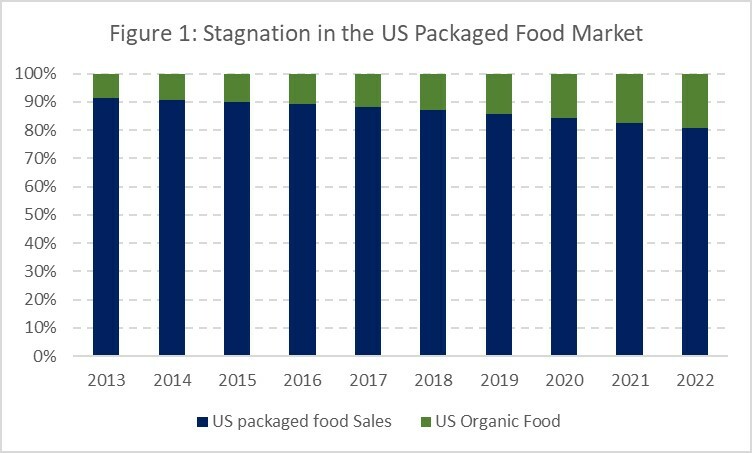 Figure 1 below shows the US packaged food market in structural decline relative to healthier preferences. The market has been growing at just 2% over the last few years while the organic food segment has been growing at six times that rate. 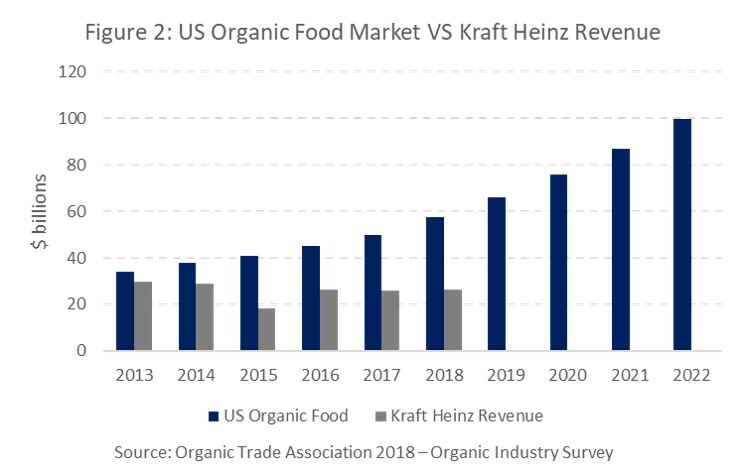 Figure 2 shows the US organic food market in dollar terms against Kraft Heinz’s stagnating revenue, we believe this is core to their challenge, and the future projections remains bleak. Now Kraft revealed additional, more specific, problems last week. The merger hasn’t been handled well from an operational perspective, manufacturing and logistics costs are higher, goodwill write-offs were much bigger than expected and they announced a pending SEC investigation into their accounting policies. The structural shift in consumer habits, however, offers a more interesting lesson - the buy-and-hold mantra that pervades much of the investment industry is being challenged, even in traditionally stable industries. Quickening dynamics in all markets are making business life more challenging than ever, not only for companies managing a merger on the scale of that between Kraft and Heinz, but for all companies large and small. From an investment point of view, betting on indefinite success – even in the most stable industries - is becoming a dangerous game. Overall, these minutes appear to have been written to further calm the markets by signalling patience, flexibly and data dependence. The FOMC acknowledges that market volatility has tightened financial conditions at a time when global economic activity has shifted down a gear, primarily due to weakening global activity. Therefore, a more pragmatic approach to monetary policy is required. It is clear from the comments they are aware that recent communication missteps exacerbated market volatility. The committee remains confident on the outlook for the US economy but, are now undecided as to whether the next policy shift will be a tightening or easing of monetary conditions. We broadly concur with the FOMC’s assessment. The US economy looks to be in good shape while the risks are coming primarily from the European and Chinese economies. Interestingly, in the few weeks since this meeting those none US risks look to have shifted materially. Anecdotal evidence coming from corporates operating in China suggest that economy is holding up much better than was expected in Q4 2018. In particular, luxury goods companies have reported strong demand suggesting the much-discussed weak demand for Apple’s iPhones is more about Apple’s prices than Chinese demand. On the other hand, the outlook for Europe has continued deteriorating since January with notable signs of weakness in the German Industrial production data. Overall our assessment of these minutes is the FOMC is shocked and chastened by the market volatility in Q4 2018 and is now likely to err on the side of easier policy for the foreseeable future. Our translation: if it comes to a choice between inflation and employment, they are not going to damage the labour market for a few tenths of a percent on CPI. Our translation: We hear you! “balance sheet normalization process should proceed in a way that supports the achievement of the Federal Reserve’s dual-mandate goals of maximum employment and stable prices. Consistent with this principle, participants agreed that it was important to be flexible in managing the process of balance sheet normalization, and that it would be appropriate to adjust the details of balance sheet normalization plans in light of economic and financial developments if necessary to achieve the Committee’s macroeconomic objectives. Our translation: Balance sheet normalization is no longer on autopilot and may be close to complete. This significantly reduces one of the market’s biggest concerns. Economics, especially monetary economics, has a tendency toward utopian fantasy. The latest utopian fantasy to emerge from monetarist economics goes by the name Modern Monetary Theory or MMT. It is worth paying attention to the debate around MMT because it could have important implications for financial markets. Some advocates of MMT are using the theory to claim governments can spend without limit, and that they can do so without raising taxes. They can do this, according to MMT, because governments can print their own money. As a result, governments can safely accumulate an unlimited about of debt, because they can always print new money to pay off that debt. Unsurprisingly, some critics of these ideas have dubbed MMT a Magic Money Tree. The current environment of political populism is providing a willing audience for learned economists willing to tell politicians it is safe to spend without limit. As a result, MMT is beginning to gain an audience amongst policymakers. The idea underpinning MMT is both simple and true: sovereign countries that control their own monetary system can print an unlimited amount of their own currency. It follows therefore, a government who controls its own monetary system, and who borrows only in its own currency, need never go bankrupt. If its debts become too burdensome it can simply print the money to pay them off. If the government wishes to spend more it can simply print the necessary money. What’s more, because the spending can be funded with printed money it is unnecessary to raise taxes to match the higher spending. This line of reasoning leads advocates of MMT to conclude that governments can and should fund any and all worthy causes ranging from infrastructure investment to social security and healthcare costs. Hopefully by now MMT is sounding too good to be true, that is because it is too good to be true. Although governments can print themselves unlimited money, they cannot turn that newly printed money into productive real economic activity. A simple thought experiment helps explain what is likely to happen if a government chooses to print itself more money and then spend that money. Because economic activity is a relatively slowly moving variable, we can assume the real economy – the amount of goods and services being manufactured and sold – remains roughly constant through the money printing exercise. As a result, when a government awards itself more spending power, through the printing press, it will be able to buy a greater share of the country’s economic output. This will leave a smaller share of economic output available for the private sector. In other words, the purchasing power of the money held by the private sector will fall. This is of course is what we mean by inflation – rising prices or equivalently a falling value of money. Looking at the money printing process in this way is helpful because it makes the connection between money printing and taxation clear. A government may gain spending power by taxing its citizens, which reduces the citizens’ spending power, or by printing its own money, which also reduces citizens’ spending power in the same way. It would therefore appear that Government spending through monetisation and through taxation are equivalent. There is no free lunch and there is no Magic Money Tree. In practice, however, there are some important political differences between a government funding itself through taxation and one funding itself though the printing press. A government funded through taxation will find its spending plans closely scrutinised by a population, quite rightly, resistant to excessive taxation. By contrast a government funding itself through the printing press appears to be giving without taking. Monetised spending is popular, even populist, and usually occurs without scrutiny. It is the lack of oversight that accompanies monetised government spending that is especially dangerous. History has shown us once a government begins funding itself through the printing press the process often spirals out of control, leading to an inflationary spiral. The inflationary spiral then tends to damage economic activity leading to a contraction in the real economy. As a result citizens find themselves suffering a falling share of a contracting economy. Zimbabwe is a recent example of such a monetised economic collapse, Venezuela a current example and Turkey a potential example. To be fair to the more moderate faculty of the MMT school, some proponents of MMT recognise the inflationary dangers associated with monetised spending. This group tend to argue governments can and should increase spending but only up to the point at which inflation starts to become problematic. Though theoretically appealing this approach carries significant dangers. The key difference between MMT and Keynesian stimulus appears to be that Keynesian policies are seen, in theory, as temporary counter cyclical measures whereas the proponents of MMT appear to be arguing for permanent stimulus on a much larger scale. Given the lags in the relationship between recorded inflation and monetised spending and the difficulty in reversing spending plans once enacted, it is hard to see how the MMT mindset, if adopted by policymakers, will not inevitably lead to an inflationary cycle. For investors the most obvious consequence of MMT would be a significant reduction in the real spending power of money. Money would become worth less and in extremis literally worthless. Investors holding cash or nominal bond portfolios would likely suffer the greatest losses in real terms while those real assets would likely fare much better. To be clear, we don’t see the inflation risk posed by MMT as an imminent threat. But populism is on the rise and historically populist leaderships have proven especially susceptible to monetary snake oil. We have been surprised by increasing commentary around MMT and the degree to which it is being taken seriously. We will be keeping a close eye on the MMT debate and advise others do the same. 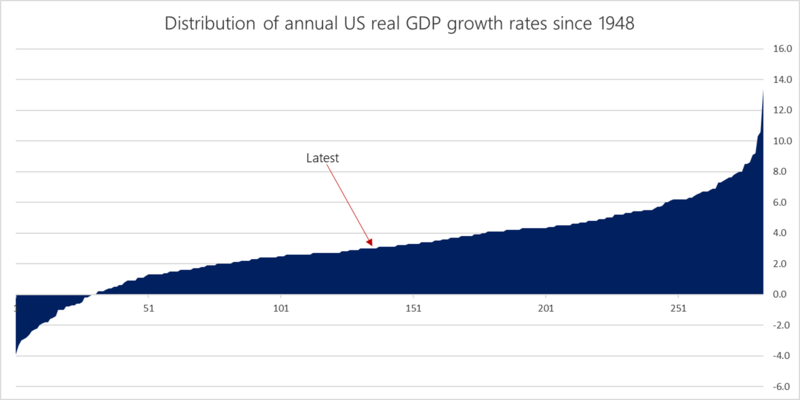 Our recent posting, Beware the Mean Reversionists, showed how the current US growth spurt is unremarkable in terms of its longevity or impact and, even if it was an outlier, the current growth rate itself is average by historic standards. Of all 283 twelve-month rolling growth rates since 1948, the current run-rate is about midway. When economies do slow dramatically it’s often down to debt. When households and companies overstretch themselves, they effectively experience an economic exhaustion. Growth slows when the private sector comes to realise it’s overspent and over-indebted. When we look at the headline numbers in this respect, we are reassured. 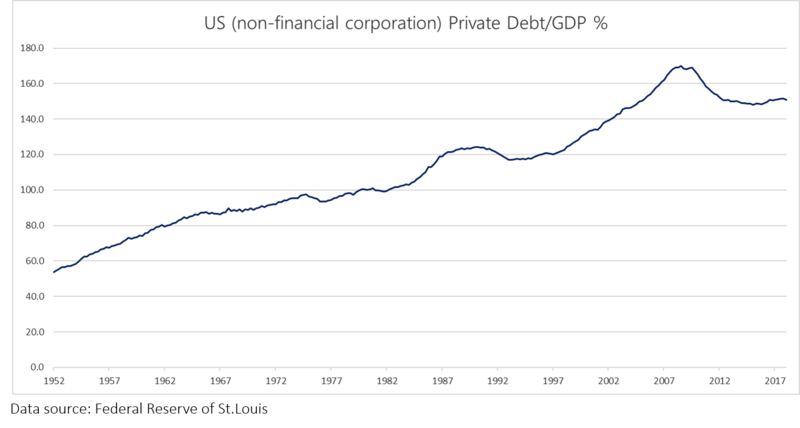 The US private sector is not as indebted relative to GDP as it was before the Global Financial Crisis. 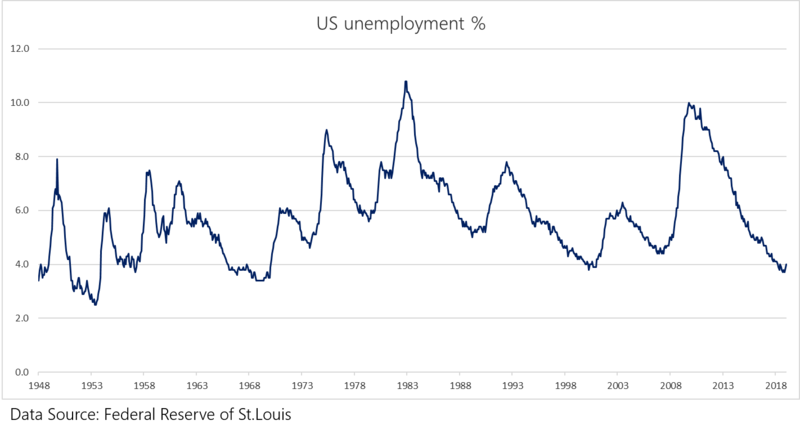 Moreover, although some pundits have pointed to historically low unemployment as a limit to growth, there’s room for optimism. The recession after the financial crisis, for a myriad of reasons, kicked a high number of participants out of the jobs market – a fall too steep to be driven by demographics alone. 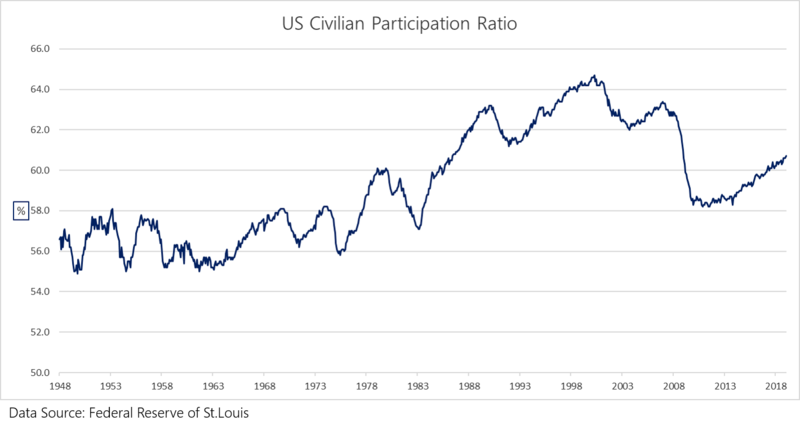 It’s not unreasonable, therefore, to assume that the participation rate - the percentage of the civilian population that make themselves available for work - could pick up meaningfully from here. The global economic backdrop isn’t providing a tail-wind for the US right now, but headline data in the US at least doesn’t suggest the current growth spurt will die of old age. We’ve heard it said a lot recently that the US economy has peaked and, although the world isn’t without challenges, much of this argument hangs on the simple view that it’s had such a good run of late, what goes up must come down. The Mean Reversionists, as we call them, generally assume that the longer the period of unbroken growth, the more likely it is to break. We’ve looked at the numbers and, even if the Mean Reversionists are correct, the current US growth spurt really isn’t that remarkable in terms of either length or magnitude. This chart shows US real GDP since 1947, with the duration of growth spurts (in quarters) on the horizontal axis and the increase in GDP (rebased to 100) on the vertical. 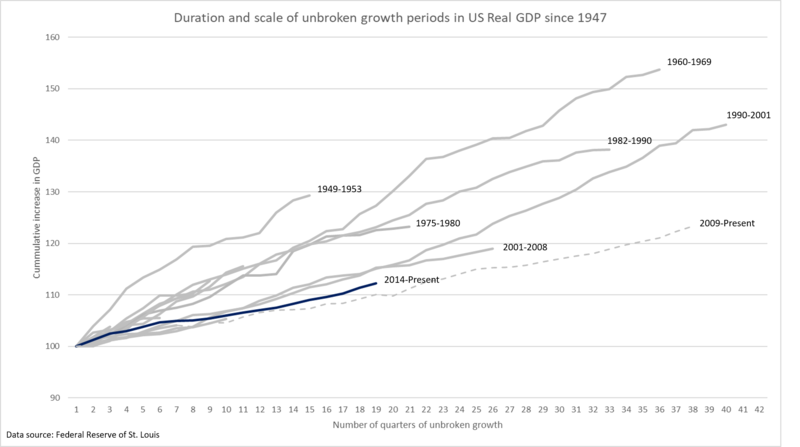 Given the economy stalled briefly at the start of 2014, the current period of unbroken growth (the blue line) is neither mature nor profound by historic standards. To be fair the decline in 2014, as in 2011, was extremely small so being less purist with the data we also show the period from the end of the Global Financial Crisis to now (the dashed line). Although this growth spurt has a few grey hairs, it’s been very anemic by historic standards in terms of cummulative growth. We’ll address some of the broader challenges in later blogs but for the Mean Reversionists, at least, the data doesn’t back up their argument. The team here at Equitile constantly analyse the world around us and so we decided to launch a new blog as an informal way (you can expect the odd typo!) to share some of our observations, insights and ideas with our clients. We have called the blog Rational Exuberance to remind ourselves to pay due attention to the positive processes of innovation which drive economic growth and, ultimately, investment returns. Naturally, we remain alert to risks, and we will share our thoughts in this respect, but we endeavour not to fall too far into the very human trap of focussing unduly on hypothetical negative scenarios – especially those which dominate the media. To gain a deeper understanding of why we think this way, we recommend the late Hans Rosling’s Factfullness or our own synopsis of his work The Anxiety Machine. When he made that speech the US stock market had rallied 200% over the previous decade. His thinly veiled warning of irrational exuberance looked eminently sensible and doubtless encouraged some prudent investors to divest their holdings. A little more than two decades on from the Irrational Exuberance speech the US stock market has rallied another 280%. In the years since December 1996 there have certainly been some wrenching financial crises. Nevertheless, innovation has continued driving economic expansion, people around the world have become healthier and richer and the investors that remained rationally exuberant over the time have enjoyed the benefit of that progress. In coming decades there will doubtless be more financial crises and market setbacks, but there will also be innovation, economic growth and, we are sure, good investment returns to be enjoyed.